ETKA EPC (Electronic Parts Catalogue) contains information about spare parts and factory accessories for VOLKSWAGEN, AUDI, SKODA, SEAT (all regions, Brazil, China, Local Market, Mexico, South Africa, USA). ETKA is the most comprehensive documentation available on the market at the present day (updated version shows 2012 models). Fully detailed zoomable diagrams, schematics, exploded views, make this software very useful for assembly and disassembling. All sections are printable. Change the level of magnification. Items in the illustration can be moved around by pointing, clicking and dragging. 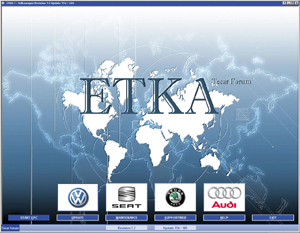 ETKA contains very detailed information about every part of any Volkswagen, Audi, Skoda, Seat created from the early days until today and that is the reason that makes this program perfect also for old timer collectors (ETKA includes the old original beetle form the 40s!!! ).